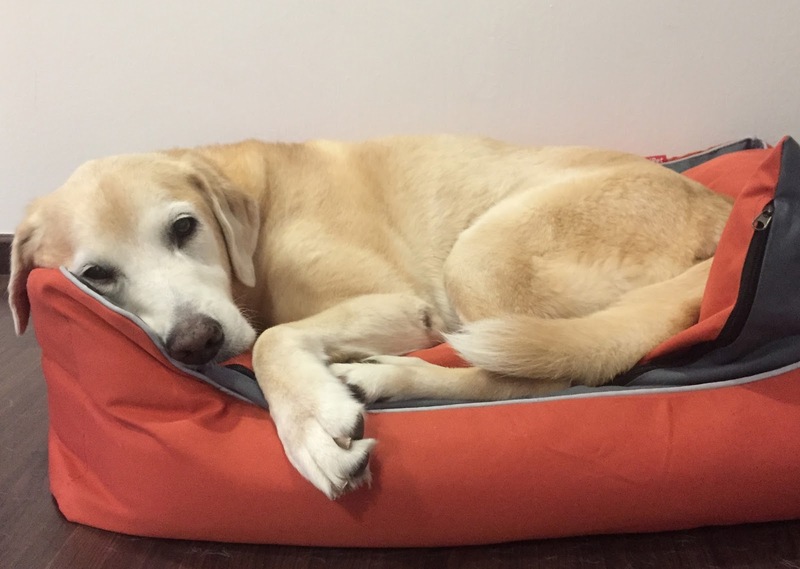 Some of you may already know, I received my 'MiniPet' Dog Bed as my 10th birthday present from Silversky Pets, who is more familiarly known as our (Frodo and I) food sponsor - our beloved Wellness Pet Food. Mummy was contemplating for some time about getting me my own bed as she wanted to kick me out of bed. I'm kidding. The main reason being that her bed is very high and with my wise age and less-than-perfect hips, she thought it'd be a good idea for me to have my own bed to sleep on. She asked me if I would like my own bed. I did not answer. I did not want her to know that I would continue to sneak up onto the bed in the middle of the night. Mummy had been eyeing on the 'MiniPet' Dog Bed since she saw it on Silversky's catalogue. One thing about mummy, it is never about plush and lush with us. Mummy always says, "The way the boys shed, they can make their own plush. Sometimes... I even forget what's my original flooring." Anywoof, there was not much to the description of the bed. All it says is "Water Resistant Pet Beds" and it has removable covers. There is no information whatsoever of the material, fabric content, fabric finishing, washing instruction(s), country of origin/manufacture and most of all, this 'MiniPet' brand DOES NOT even have a website to refer to. Based on the photo image, mummy figured it should be some canvas material but in terms of what makes it 'water-resistant', she has no clue. It is definitely no fancy orthopaedic pet bed and certainly no fancy design either. It was just good 'ol colour blocking which suits our fancy. We are definitely no leopard-print or floral-print dogs. We are, afterall, mummy's boys. So as my birthday got near, mummy selected the pet bed as my birthday present and conspired with Miss Y to have it delivered to my secret getaway location. My surprise birthday present from Silversky, me likey! Most of all, I finally have my own bed. Throwback to me spending some love-time with my Lil' Mermaid on my new pet bed. And because it is water-resistant, who cares I was all wet after all that swim? Post my birthday, Frodo was clearly not too happy about not having his own pet bed. So he made it a point to let Silversky know. But of course! Everybody loves Frodo. All he needs to do is pull a face and the world melts at his feet. So much to mummy's disbelief, Silversky offered another bed... JUST FOR FRODO. FRODO CHOO. Mummy nearly fell off the chair. That was her "WTF" moment. I put my paws around mama to console her, "Mum, it's okay. 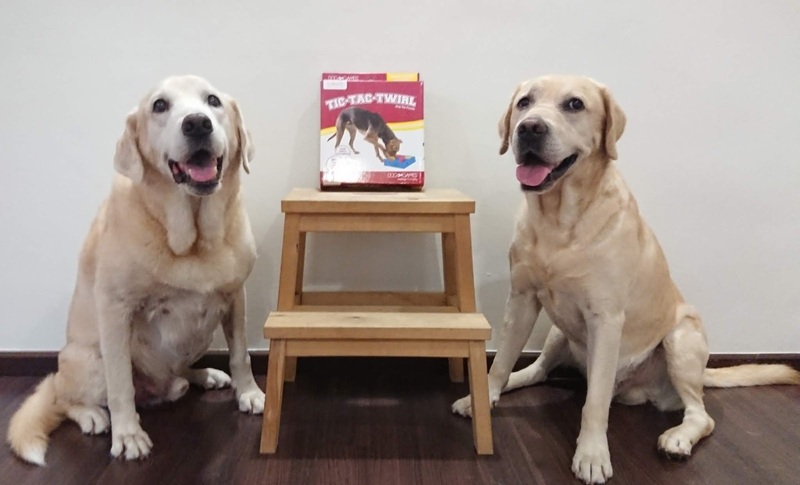 不同狗不同命 (different dog, different life)." 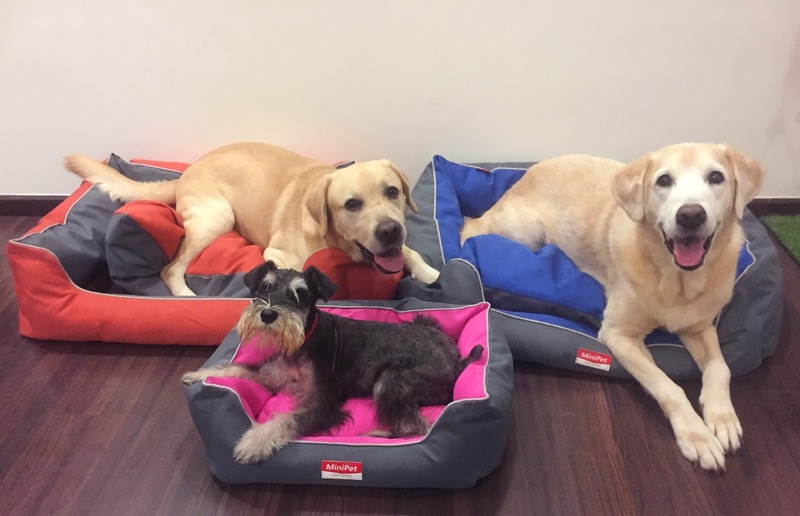 Regardless, I am still very thankful for Silversky's generosity in giving Frodo his own bed which mummy did not pick it up till we went to pay them a visit during Chinese New Year. It took a few months before mummy went to collect Frodo's bed but better late than never. And as you can see from this photo, the 'evilness' of the beds was showing itself.... it brought out the best of our sulks aka emo-blackmail. I love my pet bed loads. Reversible - Once in a while, when she gets bored, she will flip the frame and/or flip the cushion to get a different colour combination. That also means, if one side is slightly stained, she can flip it to the other side and not send it to the washer immediately! Removable Covers and Machine-Washable - Hi. This is my lazy and practical mummy. She wants easy maintenance and care. Don't need to be fancy. Convenient is good. The zipper that opens the soul to the innards... and the embarrassing evidence of our shedding ways. Canvas Material - It's cooler (for us) than plush and easy to spot ticks/fleas too? *guffaw* Face it. We live in Singapore. Our tropical weather makes this tick/flea problem almost inevitable even with the appropriate prevention applied or consumed. 'Water Resistant' - This was when mummy raised her eyes. Call it occupational hazard but any big claims like 'water resistant' had to be proven. This brand has no website, no fabric content nor wash care label.... No documentations anywhere to show the fabric treatment to make it 'water resistant'. Mummy was dubious and decided it was time to test the bed (watch above video). I guess the bed passed the water-resistant pretty all right although mummy still wished there were the industry-standard labels and more information about this water-resistant claim. Base of the bed: The "anti-slip" is only on one side, this side. A close-up look at the 'anti-slip' fabric. It is similar to the anti-slip soles on those bedroom shoes/slippers. This side of the bed is smooth-surfaced. Even so, I have not seen Frodo magic-carpet ride with the bed. Either Frodo is highly-skilled or the bed may not actually need the anti-slip base. Either way, it's good to know there's anti-slip. I guess we dogs have no complains about the bed rustling when we move. It comes in especially useful when one needs to prove a point to the human that we, the dogs, are not happy. The humans, however, are not pleased about the rustling that comes with the our toss-and-turn bustle. They complain that it can be quite irritating especially when they have not comatose and/or getting woken up with our bustles from the rustles. HOWEVER, this rustling problem is more prominent when Frodo and I use the bed. Pebbles, being 25 kg lighter than us, does not rustle her bed. The other thing as well, her midget bed being so much more compact also appears sturdier as compared to our giant beds. So fair to say, this 'rustle with the bustle' problem is only an issue for possibly medium to bigger size dogs. The bigger the dog, the bigger the bed, the louder the rustles. This canvas fabric clearly is not good friend with shedding dogs. Our fur do get stuck on the fabrics and regardless of how violently mummy tries to shake the fur off, it does not fall off. So who needs plush bed when we can self-create one (make it two) with our own fur. Talk about being economical! My self-created 'plush' bed. *guffaw* The fabric is not 'stain-resistant' either so it does get stained pretty easily. But no fear, the covers are easily-removed and machine-washable! She is my sister. My sister has "golden-backside" ("gim kar chng"). Golden-backside is otherwise known as Queen Pebbles. Queen Pebbles is also otherwise known as Ah-Lian. And ever since I got my bed, EVERYONE wants my bed. Frodo wanted my bed and pulled a tragic face, Silversky gave him one. Mummy loves squeezing into bed with me. Uncle Nic also loves squeezing into bed with me when he comes to visit. I seriously do not understand what's wrong with the humans. And goes without saying, Ah Lian wants my bed too. Not just WANT, she does a world-takeover of my bed. World takeover of my bed by the Ah Lian and she hoped that she is so black, mummy cannot see her. The thing about being the eldest child in the fur-mily... what is mine is theirs. What is theirs, is theirs. Seeing how much Ah-Lian aka Golden Backside (Gim Kar Chng) aka Queen Pebbles loves my bed, mummy and daddy decided it was time to buy Pebbles her own bed. Daddy did not get to choose the colour. Mummy decided she was getting the Ah-Lian PINK and that was that. 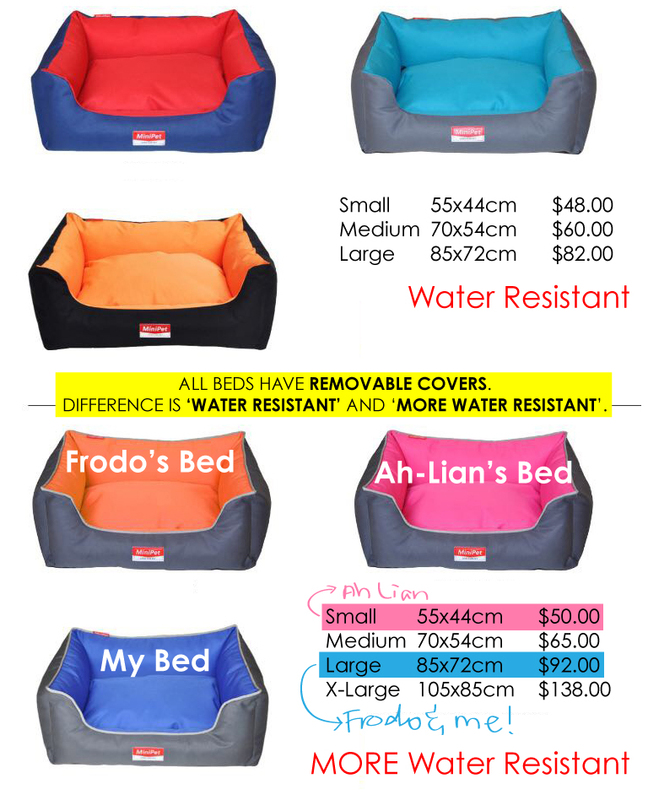 The price difference between 'Water Resistant' and 'MORE Water Resistant' is marginal especially for Ah-Lian sized bed. 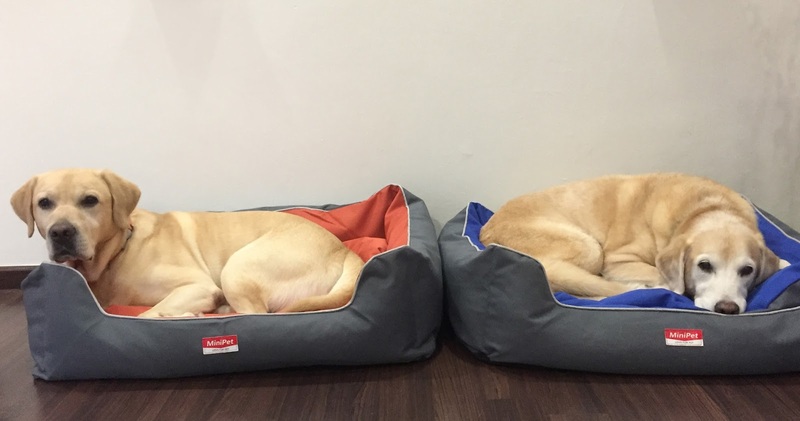 So mummy decided to be fair and got her the same bed as ours. 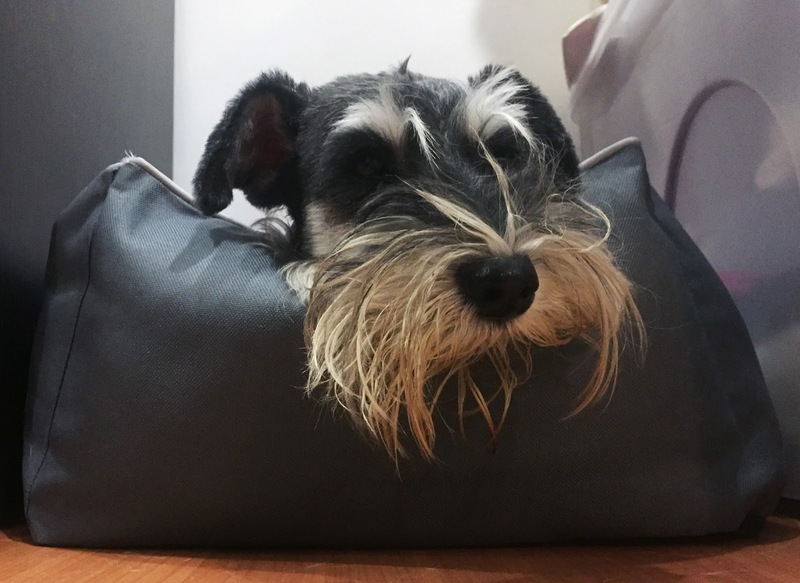 With the addition of Ah-Lian's bed, our collection of 'More Water Resistant' MiniPet Dog Bed is complete. Ha! Mummy insists these pet beds are eeeeee-vil. You see, since the day I got my pet bed, I have mastered the art of using the bed at pulling daily emo-blackmail at mummy. Then along came Frodo's bed and mummy had to deal with double-emo. Double-Emo Moment with Frodo Choo and Yours Truly. It doesn't matter who lies on whose bed. The main point is... make the human feel bad. Very very bad. Don't ask me why but our beds are actually strategically located to our advantage. Whenever I notice mummy about to leave home to go to work, I would make it a point to walk purposely to the bed, slump down with the rustling bed for added sound effect, let out a big sigh and pull an emo-face. Sometimes, when I feel that one bed is not dramatic enough, I would repeat it on the other bed. Just visualize mummy standing at the doorway and looking at this face... using Frodo's bed to support my face to increase 'tragic' value. Move to the second bed to up the dramatic value. No lie about it. Ah-Lian went into emo-mode shortly after introducing her to her new bed. I could hear mummy screaming. "It's a doggie conspiracy theory, I tell ya! I'm starting to regret getting them their own bed because these pet beds are made just for EMO-BLACKMAIL. Period!" 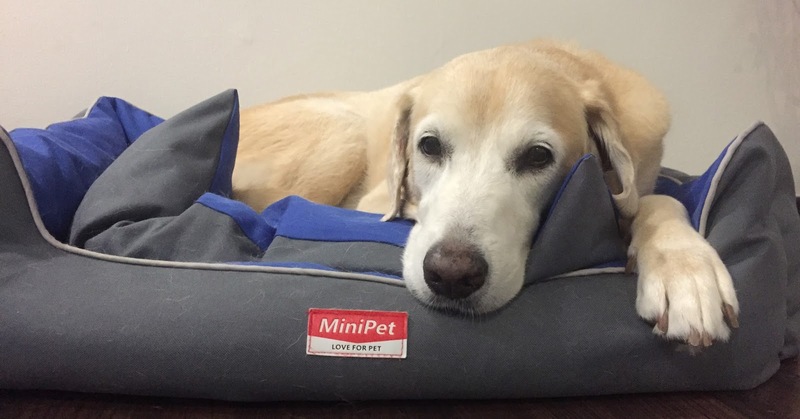 So yes, ladies and gentlemen, these MiniPet Beds are brilliant! Every doggie should own one. If there's no way to join the human(s), emo-blackmail them! I believe these MiniPet Beds are available at most major pet shops. Retail prices may vary. Alternatively, if you would like to get it online, it is available at Kohepets online store. Use Flapper10 promo code for 10% discount (valid till 15th May 2017 for first time customers) or Kohe8 for $8.00 off your purchases (no expiry date; for first time customers).